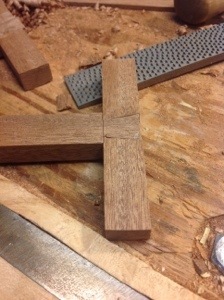 One of the techniques that I learned a Paul Sellers 9day foundation class was the construction and use of a mortise jig. I don’t always use them these days, but occasionally I find them helpful. 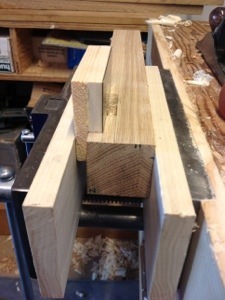 After my latest experience with making mortise and tenon joints it seemed prudent to take my time and make a new jig. 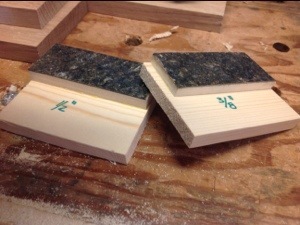 ITs really a sinple process and involves selecting a small piece of scrap to act as the back and then planing a seconpiece the correct thickness to act as a guide for the chisel. 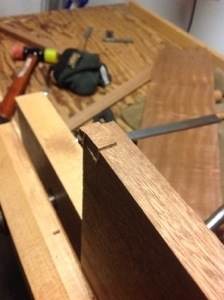 Once glued together and clamped (I sued my bench clamp) it acts as a great guide. I must have 6 or seven guides now of varying thickness. 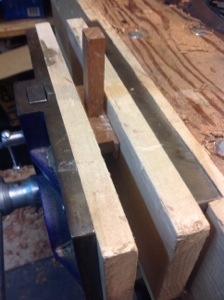 While taking one of the small tool chest sides out of the vise it slipped from my hands and hit the floor. Of course it landed on a corner, and as always it was the corner that would be most exposed. Looking at the damage to the corner I considered if it could be left or needed to be repaired. Replacement of the board is not an option because it is a tool chest for myself, the wood is expensive and repairing the damage would be a fun challenge. I’ve made a few repairs over several years some successful and some looking worse than the original damage. I am a repair amateur but willing to learn. 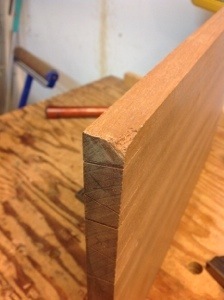 This corner looked like the perfect opportunity to trim the damage off and insert another piece planing to fit. Searching through my scraps I found a piece of wood that appeared to have similar grain. 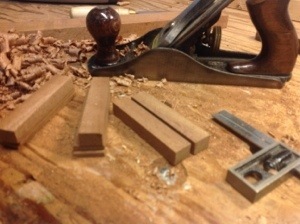 Next I cut and chiseled off the piece that I wish to replace and cut a replacement piece.Trimming carefully with a chisel I attempted to match up the replacement piece to the wood. I the glued it in place and used tape to hold it while the glue dried. 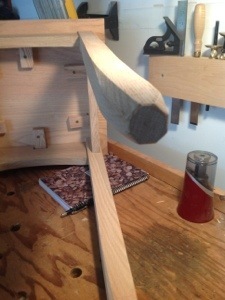 The coffee table has three mortises in each leg and and eight more supporting the shelf. 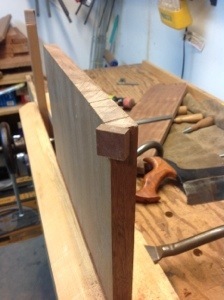 Chopping mortises by hand is like running. The first steps are rife with anticipation, the next come with labored breath, but with training and patience a rhythm is developed that helps clear the mind and ends in an intense focus. It’s probably a little too far out on the limb to describe it has “mortise chopper’s high” but it is a very calming work. 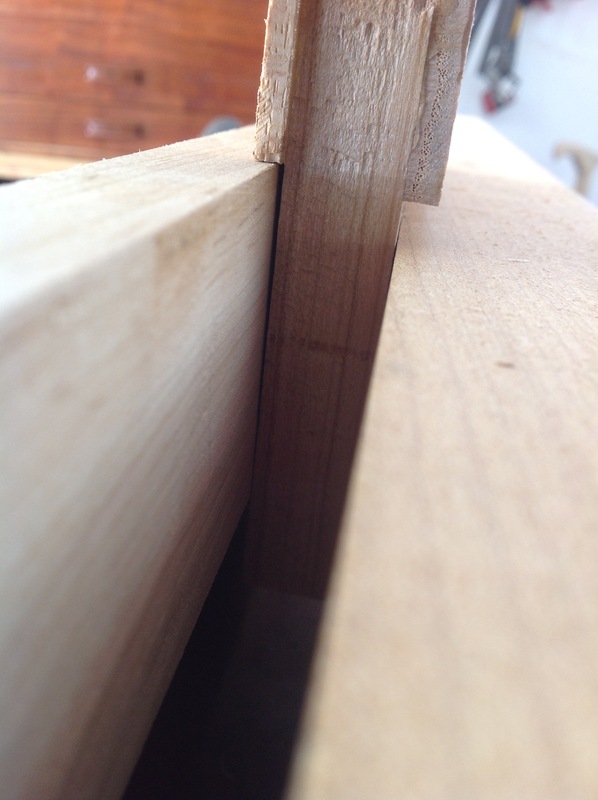 Ensuring crisp edges especially where a through mortise is chopped takes practice. Helping a long the way is this little guide that Paul Sellers introduced me to a month ago. 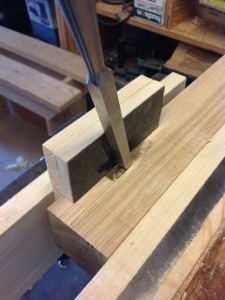 It is simply two pieces of wood and a small piece of counter top that can be used to guide the chisel along one edge. 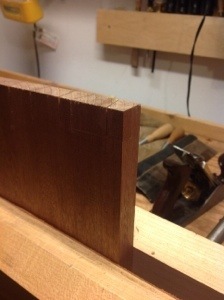 Making two of them one 3/8″ and the other 1/2″, they can be placed adjacent to the mortise and as long as I register the chisel against it, I will maintain a very nice edge. 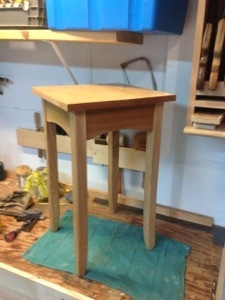 The final project in Paul Sellers’ Foundations class is a side table. 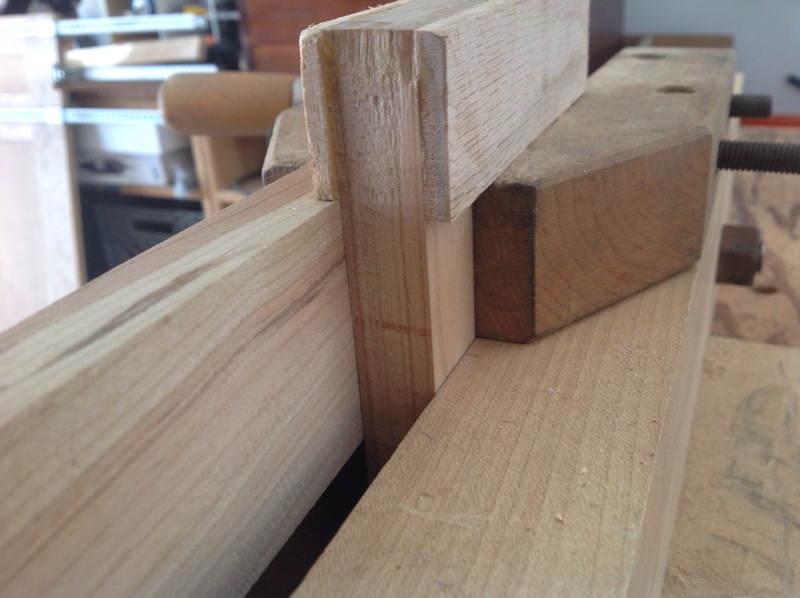 It constructed of oak with mortise and tenon joints. As always Paul gathers the group around his bench to talk about the properties of oak , introducing us to hand and cabinet scrapers and giving us the knowledge to work with the wood. Looking through my photographs of the stages in this project I notice they are lacking. 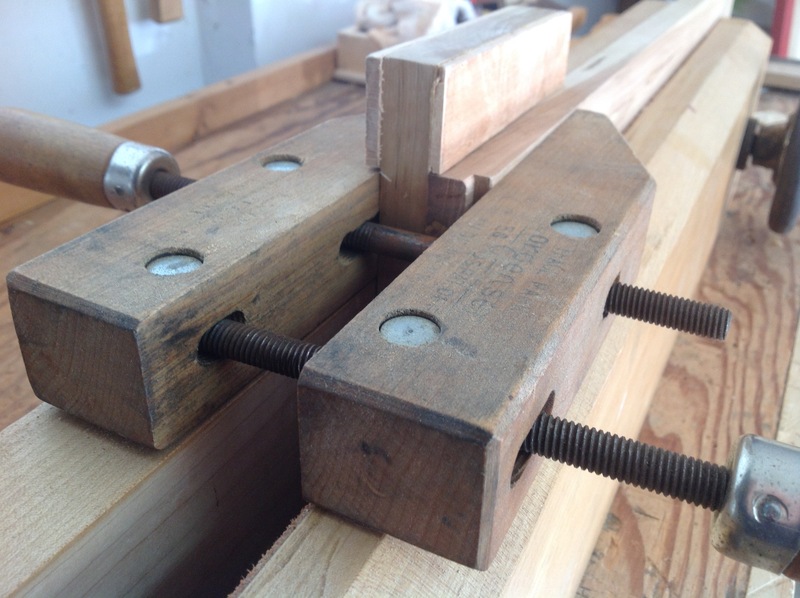 By this point in the week of class I was comfortable and confident in my work and the steady rhythm of chopping the mortises drove me forward. The table, like all of Paul’s projects, teaches at each step and provides insight into further lessons. 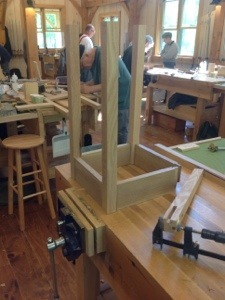 After completing the mortises in the legs and cutting tenons (using 3 different methods) we proceeded to shape the legs. 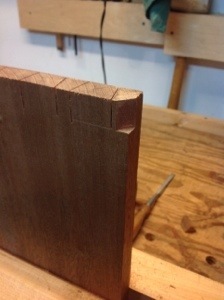 After watching a demonstration and working through the method I overcame me fears, and using a chisel began to shape. (picture of leg end I took after the fact when I returned home. 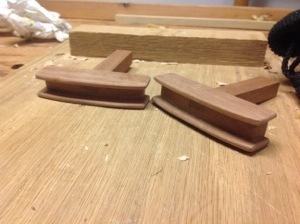 What appeared to be a daunting task proved very relaxing and using a chisel, plane and spokeshave I was able to complete all four legs in a little more than an hour. 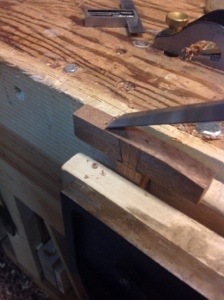 Looking back at the legs I realize that it was a critical moment in the class when I suddenly felt the confidence to put chisel to wood and know that the result would be good. 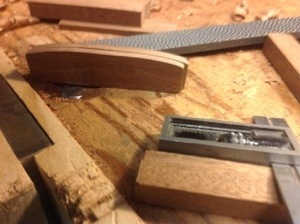 With the legs complete the top was glued up and smoothed with the plane. 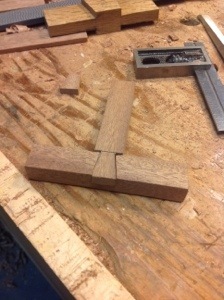 Not missing a chance to teach, Paul showed us a great method to make turn buttons which I will share in a later blog. The next picture is the finished product. 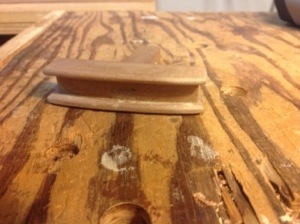 I used shellac with a couple of coats of poly on the top for protection and wax. It now sits by my daughters bed.